Back in July I wrote a post entitled “The great lie about people”. And today I feel an urgency in my spirit to revisit that idea. 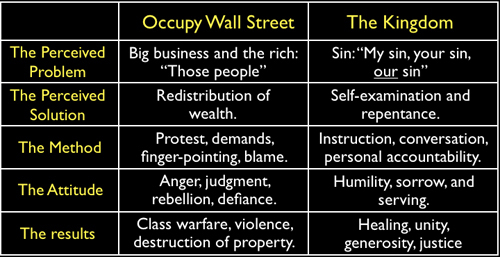 From the beginning I fully expected the Occupy Wall Street demonstrations to wash out quickly. With the muddled messages of those first protestors it seemed unlikely that such a movement could gather enough steam to become a legitimate force. But now with protests multiplying across the world and Christians beginning to join the fray I want to bring some kingdom perspective into the mix. Few of us would deny that greed is a growing cancer, or that justice has fallen victim to corruption in high places. Those are two major problems. But the methods of the protestors are a dangerous mix that will leave even greater destruction and injustice in it’s wake. No movement that confiscates the wealth of some to satisfy the demands of others could by any stretch be considered just. God has a better solution, one that actually works and doesn’t compound the injustice of poverty with the injustice of stealing the wealth of others. But we, the church, must learn to offer the hope of the Kingdom to the hungry world. Until we do, society will continue it’s steady march towards the rule of the mob. Love every word of this.